A 46-year-old man in China will soon be able to speak and write again with the help of a 3D implant, after losing half of his skull in a tragic fall 10 months ago. Hu, a construction worker from Beijing, was struck in the head by a supporting beam when he fell three stories to the ground, leaving him with severe brain damage. With the support of doctors at the Xijing Hospital in the ancient Chinese city of Xi’an, and Stryker, an American company, Hu will regain the ability to perform basic tasks, since his brain will gradually regenerate itself with the custom-made titanium mesh implant. The Chinese man is currently suffering from post-traumatic skull defects, traumatic aphasia, limited motor function, left ptosis with vision loss, and traumatic aphasia. Hu is also experiencing a severe case of double vision, referred to as diplopia. Although he has lost his ability to speak and write, his wife says he can understand what people are trying to say to him and about him. In his neighborhood, Hu is known as the “half headman” or "Frankenstein,” according to Chinese Internet company QQ's news service. Although Hu may struggle to speak and write, he has little problem getting around. The part of the brain that controls planned muscle movements like walking, in the cerebrum, was unaffected. The large outer part of the brain also controls reading, thinking, learning, speech, emotions and other muscle movements. Professor Shu Mao Guo, head of the Department of Plastic Surgery at Xijing Hospital, expressed Hu’s case is very rare and finding a solution to fix the damaged skull is quite complex. It was there that the hospital brought in experts in the field who came up with the idea for a 3D-printed titanium mesh that would cover Hu’s brain and help make his skull look normal again. 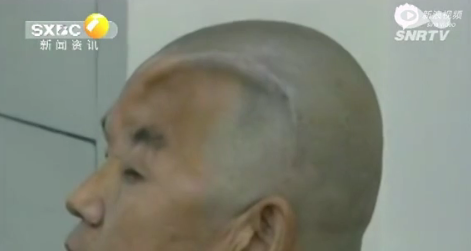 Guo told Hu Shang Daily, a Chinese newspaper, 3D printing allowed for doctors to take a scan of Hu’s head and 3D print a titanium mesh using his right side as a template. This will give off a symmetrical appearance. While 3D printing helps reduce surgery trauma and cuts the duration of the operation, the revolutionary surgery does present risks for Hu. Surgeons must carefully separate the scalp from the meninges — protective membranes that cover the brain — that have healed together after the accident, without damaging the brain. Typically, the immune system accepts titanium mesh, but there are cases where the body can reject the material — a possibility for Hu. Hu isn’t the first patient to undergo surgery for a 3D implant. Last week, surgeons in China implanted an artificial 3D-printed vertebra into a 12-year-old bone cancer patient, which will help him walk again, the Daily Mail reported. Doctors at Peking University Hospital in Beijing removed the tumor in the second vertebra of the boy's neck, and then replaced it with the 3D-printed implant between the first and third vertebrae to allow him to lift his head. Hu’s operation is expected to be successful like the bone cancer patient. Currently he has been transferred to the ICU for observation and is expected to be released from the hospital in four to five days. Doctors hope once the skull cavity has been restored and the brain regenerates itself, Hu will be able to speak and write again.